August 5 - Dedication of the Basilica of Saint Mary Major - Optional Memorial - My Catholic Life! A house is more than a building. When it personifies the family within, it is a home. Or at least it should be. That an office building contains businesses, a house a family, a barracks soldiers, and a hotel guests is merely to cite particular instances of the architectural credo that form follows function. Buildings look like what they do. When they don’t, everyone suffers from the incongruities. A modern sports stadium doesn’t look like a medieval gothic cathedral, because the two architectural forms have two different functions: to entertain and to worship God. Today’s feast commemorates a building, not a person. It is a memorial to the “baptism,” or dedication, of one of the oldest churches in Rome dedicated to the Virgin Mary. 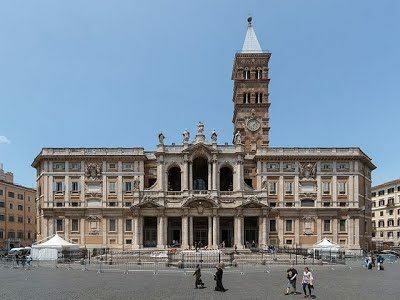 The Basilica of St. Mary Major (meaning the “greater” or “larger” church of St. Mary) was first built in the 350s, in the decades after the legalization of Christianity in 313, when the Church could finally build big. After the the Council of Ephesus’ dogmatic definitions on Mary as the God-bearer in 431, the Basilica was restored and rededicated. Of the four major basilicas in Rome, St. Mary Major most retains the atmosphere, the “feel,” of antiquity. The sites of the Basilicas of St. Peter and St. John Lateran are ancient, but the present baroque structures date from the sixteenth through eighteenth centuries. And the ancient, Paleo-Christian Basilica of St. Paul Outside the Walls burned almost entirely to the ground in 1823. The present structure is an impressive replica, but relatively modern. The fourth century core of St. Mary Major is, however, intact. It has been embellished, added to, and redecorated over the centuries. Nevertheless, it is to Christian Rome what the Pantheon is to pagan Rome—a complete, entire, and unscathed survivor from a built environment which has otherwise disappeared. For Catholics, a church, indeed every church, is a Domus Dei, a house of God. Whether it is full of one thousand souls, or silent and empty, it is a house of God. A church does not just keep one warm when it is cold, or dry when it is wet. A church does not become such only on Sunday. A church is more than a shelter, just like a home is more than a house. A good church is theology in stone. It reflects the truths it teaches in its very shape, in its steps up and steps down, in its arches, windows, doors, lighting, marble, statues, mosaics, floors, and altars. Every Catholic church should be able to pass the “deaf test.” That is, when a hearing impaired person enters a church, he or she should be able to easily understand what that church is teaching without hearing a single word from the pulpit or one verse sung from the choir. A religion’s hierarchy of truths should be expressed, in a confident and certain manner, by the structure where that religion’s faithful gather to worship God. One should understand with the eyes. It is not for the Catholic to “shiver in the barn of the Reformation,” as one theologian wrote, and to guess what the building is trying to say. If God himself were to pull open the immense doors of Saint Mary Major, one imagines He would walk down the central nave, look to his His right and to His left, smile, and slowly nod His head in pleasure and agreement. There, in an ornate chapel to the right, is Pope Saint Pius V. “How well he guided the rudder of my ship on earth.” There, under the altar, are the bones of Saint Jerome. “Oh cantankerous Jerome, you gave my Church the definitive text of my Word.” There, below the high altar, is a relic of the manger of Christ. “And there it all started. Resting in that wood, My Son brought the Old Testament to an end.” And on and on and on: Saints, Popes, the Virgin, the Tabernacle, the confessionals, the Stations of the Cross. God the Father would not be a stranger in Saint Mary Major. He would feel at home, surrounded by the things, signs, pictures, and emblems of the family life of the Universal Church. Rome is a small planet of art and beauty. The density of artistic treasures in Saint Mary Major, and so many other Roman churches, exercises a gravitational pull drawing all those enamored with God and His beauty toward the sacred “Mass” at the core of the eternal city. Holy Trinity, our worship of You is a matter of justice more than charity. We owe You reverence in the same way a child owes honor to his parents. Our love is inflamed by the sacred beauty of churches where you, Mary, and the saints are honored with such effusions of human genius. THERE are in Rome three patriarchal churches, in which the Pope officiates on different festivals. These are the Basilics of St. John Lateran, St. Peter’s on the Vatican Hill, and St. Mary Major. This last is so called because it is, both in antiquity and dignity, the first church in Rome among those that are dedicated to God in honor of the Virgin Mary. The name of the Liberian Basilic was given it because it was founded in the time of Pope Liberius, in the fourth century; it was consecrated, under the title of the Virgin Mary, by Sixtus III., about the year 435. It is also called St. Mary ad Nives, or at the snow, from a popular tradition that the Mother of God chose this place for a church under her invocation by a miraculous snow that fell upon this spot in summer, and by a vision in which she appeared to a patrician named John, who munificently founded and endowed this church in the pontificate of Liberius. The same Basilic has sometimes been known by the name of St. Mary ad Præsepe, from the holy crib or manger of Bethlehem, in which Christ was laid at His birth. It resembles an ordinary manger, is kept in a case of massive silver, and in it lies an image of a little child, also of silver. On Christmas Day the holy Manger is taken out of the case, and exposed. It is kept in a sumptuous subterraneous chapel in this church.